Russia is building a drone submarine to deliver large-scale nuclear weapons against U.S. harbors and coastal cities, according to Pentagon officials. The developmental unmanned underwater vehicle, or UUV, when deployed, will be equipped with megaton-class warheads capable of blowing up key ports used by U.S. nuclear missile submarines, such as Kings Bay, Ga., and Puget Sound in Washington state. Details of the secret Russian nuclear UUV program remain closely held within the U.S. government. The Pentagon, however, has code-named the drone "Kanyon," an indication that the weapon is a structured Russian arms program. The nuclear drone submarine is further evidence of what officials say is an aggressive strategic nuclear forces modernization under President Vladimir Putin. The building is taking place as the Obama administration has sought to reduce the role of nuclear arms in U.S. defenses and to rely on a smaller nuclear force for deterrence. Officials familiar with details of the Kanyon program said the weapon is envisioned as an autonomous submarine strike vehicle armed with a nuclear warhead ranging in size to "tens" of megatons in yield. A blast created by a nuclear weapon that size would create massive damage over wide areas. A megaton is the equivalent of 1 million tons of TNT. On missiles, megaton warheads are called "city busters" designed to destroy entire metropolitan areas or to blast buried targets. An underwater megaton-class drone weapon would be used to knock out harbors and coastal regions, the officials said, declining to be named due to the sensitivity of the information. "This is an unmanned sub that will have a high-speed and long-distance capability," said one official, who noted that the drone development is years away from a prototype and testing. The Kanyon appears to be part of a Russian strategic modernization effort that seeks to give Moscow the ability to coerce the United States. It is also expected to complicate the Obama administration’s attempts to seek further reductions in U.S. and Russian nuclear forces after the 2010 New START arms treaty. New arms cuts were derailed after Russia’s military annexation of Crimea and continuing destabilization of eastern Ukraine, as well as by Moscow’s failure to return to compliance with the 1987 Intermediate-Range Nuclear Forces Treaty. "It’s very difficult to consider Russia a responsible party when it’s developing something like this," the official said. Another official familiar with the program said that the Kanyon will be a large nuclear-powered autonomous submarine. This official said the size of its nuclear warhead is not clear. Russian leaders announced a new maritime strategy in July that provided hints about the new drone sub. The doctrine calls for developing innovative technologies, including unmanned underwater vehicles, IHS Jane’s 360 reported last month. The new underwater nuclear weapon is also raising concerns among Pentagon strategic planners. The Navy, in particular, is worried about the Kanyon. Navy forces are charged with conducting underwater warfare operations, including countering enemy submarines. Lt. Col. Michelle Baldanza, a Pentagon spokeswoman, declined to comment on the nuclear-armed underwater drone. The Pentagon said last week that it is closely watching a Russian military research ship that sailed along the east coast of the United States. The ship, a research vessel called the Yantar, was engaged in underwater reconnaissance, gathering intelligence that could be used to support a weapon system like the nuclear UUV. While the United States currently has no similar plans for a megaton-class underwater nuclear strike vehicle, the Navy is developing a range of UUVs, including a weapons-carrying drone. The Pentagon is in the process of retiring all of its megaton weapons. The stockpile of 9-megaton B53 bunker-buster bombs were dismantled several years ago, and the 1.2 megaton-B83 will be retired after the upgraded B61 bomb is deployed. Russia’s arsenal of megaton warheads and bombs includes an estimated five SS-18s armed with 20-megaton warheads and previously deployed 5-megaton warheads on SS-19s. Moscow once built the largest nuclear weapon, the 150-megaton bomb called the Tsar Bomba, or "Tsar of bombs." China uses megaton warheads on its DF-5A missiles. The two-dozen DF-5As are said to be armed with 5-megaton warheads. "The Kanyon represents another example of Russia’s aggressive and innovative approach to the development of military capabilities against U.S. and Western interests," said Jack Caravelli, a former CIA analyst who specialized in Soviet and Russian affairs. "The possible yield of the warhead, in the megaton class, clearly is an attempt to inflict catastrophic damage against U.S. or European naval facilities or coastal cities," he added. "Nations vote with their resources, and the Kanyon, along with an expanding number of other military modernization programs, indicates the priority Vladimir Putin places on military preparedness against the West." Mark Schneider, a former Pentagon nuclear policymaker, said Russian state-run media have announced plans for UUV development. "In 2014, Putin stated that there were undisclosed strategic nuclear modernization programs that would be made public at the appropriate time," Schneider said. A Russian weapons engineer told the state-run RIA Novosti news agency in June that UUVs are being developed. "Our institute already concluded a number of new developments in the sphere of command systems automation… [including] remotely-operated, unmanned sea-based underwater vehicles. We hope that these developments will be applied for designing of a new destroyer vessel," said Lev Klyachko, director of the Russian Central Research Institute. Robert Kehler, who retired two years ago as commander of the U.S. Strategic Command, said development of a robot underwater nuclear strike vehicle could be part of what he termed a "troubling" Russian strategic nuclear buildup. "Overall, we were watching the Russian nuclear modernization effort very carefully," Kehler said in an interview. "And that effort was finally starting to put forces in the field." Kehler said he was not "particularly bothered" by the Russian nuclear buildup as long as Moscow stays within the limits of the New START arms treaty. The treaty limits the United States and Russia to 700 strategic missiles and bombers and a total of 1,550 deployed strategic warheads. The retired four-star Air Force general said he was unaware of the Kanyon drone program. However, recent threats and belligerent statements by Russian leaders about using nuclear weapons are compounding concerns about Moscow’s arms buildup. "That was disturbing as well, their rhetoric," Kehler said. "Again, that said something about how nuclear weapons fit in their national security. From their perspective, they’re saying, ‘We still need these weapons.’"
Putin has stated publicly that he is willing to use Russia’s nuclear forces in response to Western opposition to the military annexation of Ukraine’s Crimea. Pavel Felgenhauer, a Russian military analyst, said he has not heard about the Kanyon program. "But such things could have easily been developed during the Cold War and may be still being developed or modernized," he said. Felgenhauer said a nuclear drone submarine would involve launch from a mother sub and would require getting close to a target, something he said would result in a "semi-suicidal" bombing run. Russia has researched exotic nuclear weapons concepts in the past, including underwater blasts aimed at creating massive tsunamis, like those caused by undersea earthquakes, he said. However, Felgenhauer said he does not believe the underwater nuclear drone would be a mainstream weapons development program for Moscow. 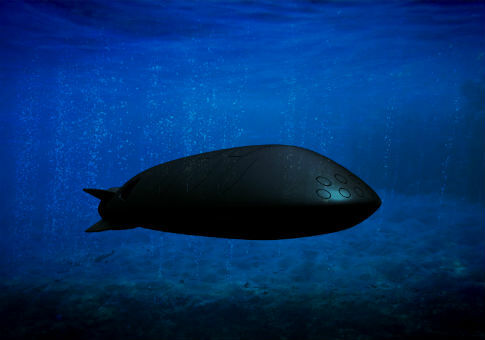 Norman Polmar, a naval analyst and author, said the Kanyon could be based on a Soviet-era nuclear torpedo disclosed in his 2003 book, Cold War Submarines. Both the Russian navy and its predecessor, the Soviet navy, have been innovators of undersea systems and weapons. "These efforts have included the world's most advanced torpedoes," Polmar said. "Early in the nuclear age, the Soviets began development of a massive torpedo for attacking coastal cities and ports." The T-15 torpedo was about 75 feet long and was capable of carrying a high-yield thermonuclear warhead some 15 miles underwater, something Polmar called "a truly innovative concept." The Navy is developing UUVs as well, including some capable of conducting strike operations. No details of the Navy’s underwater drone program could be learned. A 2004 Navy study on the subject lists nine functions for underwater drones, ranging from intelligence gathering to anti-mine warfare to special operations delivery and "time critical strike." "Warfighters need the ability to strike time critical targets at precisely the right moment in battle," the Navy study said. "UUVs can perform some of the necessary functions for [time critical strike], for example, clandestine weapon delivery or remote launch." "Stealth and long-standoff distance and duration allow a UUV to be an effective weapon platform or weapon cache delivery vehicle for TCS missions." The UUV is part of a major nuclear modernization by Russia that includes a new class of ballistic missile submarine called the Borey-class, and a new submarine-launched missile, the Bulava. Two new intercontinental ballistic missiles are being deployed as well, along with development of three more new ICBMs, including a replacement for the SS-18 and a new rail-mobile missile. A new strategic bomber is also under development, and there are reported plans to restart production of the Tu-160 Blackjack bomber. Russia is also developing a new long-range, air-launched nuclear-tipped cruise missile, the KH-101, which will be capable of hitting targets in the United States from launch areas within Russian airspace. Navy Secretary Ray Maybus said in a speech in April that unmanned systems are a high priority for future Navy weapons. "While unmanned technology itself is not new, the potential impact these systems will have on the way we operate is almost incalculable," Maybus said. The submarine warfare division of the chief of naval operations stated on its website that the future submarine force will include UUVs. "UUVs allow an [attack submarine] to safely gain access to denied areas with revolutionary sensors and weapons," the website stated. "UUVs provide unique capabilities and extend the ‘reach’ of our platforms while reducing the risk to an [attack submarine]" and its crew. The site made no mention of a future UUV strike weapon, only intelligence and reconnaissance, mine warfare, and mapping. "UUVs are key elements in maintaining submarines’ future undersea dominance against any threat." This entry was posted in National Security and tagged Drones, Navy, Nuclear Weapons, Russia. Bookmark the permalink.